By the spring of 1816 Quaker minister Edward Hicks had reconciled his penchant and skill for ornamental painting with Quaker ideas of simplicity and plainness by liberally interpreting his religion's codes about earning a living by honest work. At this time he rejoined the painting shop he had established in 1811 and began creating landscape, history, and religious art for his family and friends in Bucks County, Pennsylvania. 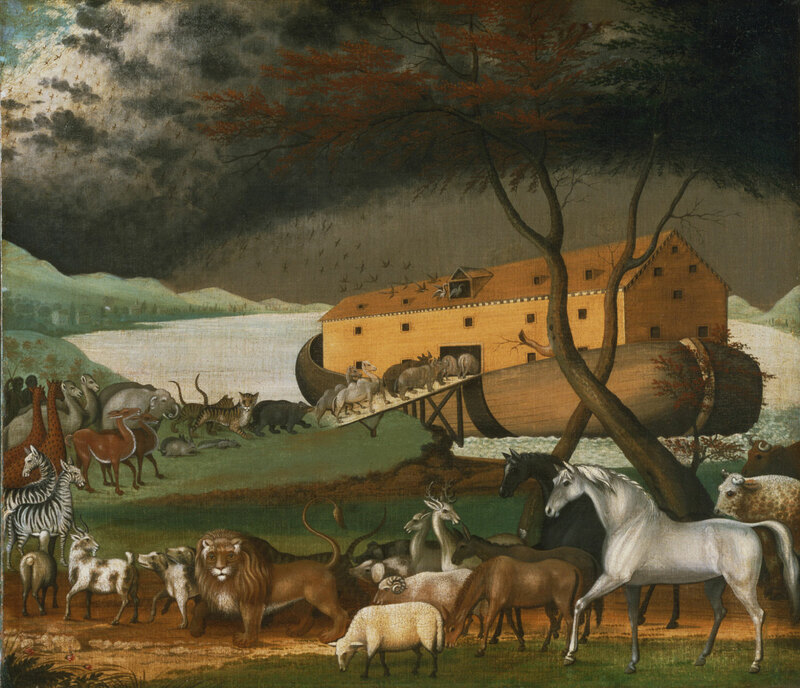 This unusual image of Noah's ark is based on an 1844 lithograph by Nathaniel Currier. The animals Hicks added to the scene resemble those in his earlier representations of his favorite biblical subject: Isaiah's prophecy of the “peaceable kingdom.” The cooperative animals express Hicks's Quaker belief in mankind's ability to live together harmoniously in nature, just as the story of Noah promises humanity a fresh start. For Edward Hicks, a zealous Quaker preacher and missionary, making a living by painting portraits or other symbols of self-indulgence was incompatible with his religious beliefs. Yet his greatest talent was as an artist, so to satisfy both his image-making impulse and his Quaker convictions, he made nearly a hundred paintings on the biblical theme of the Peaceable Kingdom, to which Noah's Ark, although a unique subject among his work, is clearly related. Hicks based the general composition of the scene on Nathaniel Currier's popular lithograph issued in 1844, but gave the pairs of animals a beauty and dignity lacking in the print. As a result, the calm procession of beasts has a stately rhythm that embodies the gravity of God's command that they enter to ark to escape the approaching flood. The grayish green horizon with looming black clouds above intensifies the drama of the impending cataclysm, and the dignified old lion staring directly at the viewer focuses attention upon this lesson of God's power to destroy and redeem. Darrel Sewell, from Philadelphia Museum of Art: Handbook of the Collections (1995), p. 281.